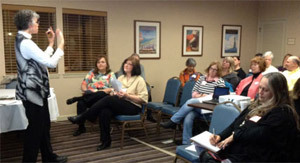 Judy offers a variety of presentations for your professional or parent group. They can be tailored for small and large audiences. Contact Judy for more information on how to bring a presentation to your group. You really are a presenter extraordinaire! Your experience, knowledge and sincerity shine through loud and clear and you are such a pleasure to listen to. You have certainly found a perfect niche for yourself that benefits so many!! I just wanted to tell you that I thoroughly enjoyed “There are No Lazy Students”, and was positively refreshed with your beliefs. I’ve been in Education for a long time, and have never heard anyone speak so honestly, and on target with understanding the WHOLE child. The term “whole” has been around forever, as you know. However, it is a rare find to connect with someone who understands the deeper meaning as you do. I am interested in attending more of your workshops, and learning more from you so I can reach my students at a deeper level, and continue my own personal growth. – Tammy P 4th Grade Teacher, Mom and Grandma!